Meanwell smps Chennai, Meanwell Coimbatore, Meanwell Bangalore we are importer, distributor, dealer,supplier in India. Meanwell smps is one of our core product in our distributed brands in India. Meanwell India consists of switch mode power supply, SMPS-Power Supply, Led Driver, DC-DC Converter, Meanwell SMPS, LED SMPS, LED power supply, power supply, invertors, DC power supply, switch mode power supply etc. We are dealing wide range of products in it & supporting the customers in better aspects all over India. Meanwell distributor in India, we have more no of dealers and customers all over India for our brands like Carlogavazzi India, fotek India, meanwell India.Our major customers are presented in all over India. We are covering Meanwell Chennai, meanwell Coimbatore, Hyderabad, Meanwell smps Mumbai, Pune, Goa, Meanwell smps Bangalore, Noida, Meanwell power supply Delhi, meanwell Gujarat, Surat,meanwell led driver Ahmedabad, meanwell Maharashtra, Kolkata, Mysore, meanwell Faridabad, Ghaziabad, Westbengal, Rajkot, Andhrapradesh, Uttarpradesh, Tamilnadu etc. We have all types of meanwell smps & LED Driver series namely NES, RS, RSP, DRP, DRT, DR, SDR, WDR, SE, SCP, SCN etc. 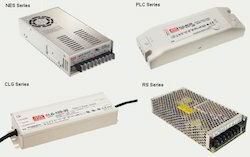 LED Drivers like CEN, CLG, LPV, LPP, PLP, APV, LPL, HLG, HVGC, OWA, HVG etc. Part No. : NES-100 Series, Output voltage like 5, 7, 5, 9, 12, 15, 24, 48. We feel immensely pleased to offer an exclusive gamut of Meanwell SMPS at cost effective price. Our offered SMPS is manufactured utilizing best quality raw-material and highly developed technology by skilled professionals. In order to ensure quality, this SMPS is rigorously tested on different parameters. Apart from this, we provide the entire range in different sizes, as per the requirement of our prestigious clients.